Outsourcing is a massive part of what I do online. As a matter of fact, this blog was designed and developed by employees I hired by outsourcing. Today, I wanted to write a quick post explaining how I use common outsourcing sites and Skype to build my own team of workers that I can tap into at any given time. If you are working online, more than likely at some point in your online venture you will find yourself needing to outsource a given task. The task could be something small like writing a 400 word article to something more substantial like having your own iPhone app created. The problem with using an outsourcing website every time you want to outsource a task is that you have to go through the hassle of creating a job, interviewing candidates, hiring workers, then paying a fee to the website when the job is completed. By growing your own list of workers, you can bypass the expensive fee’s associated with most outsourcing sites and cut down on the time it takes to find and interview candidates. When I create a job on a popular outsourcing site such as odesk.com, easyoutsource.com or freelancer.com I always interview and get the contact information (Skype) of as many qualified candidates as possible. Shortly after posting a job you will have tons of qualified candidates waiting to be interviewed. Of course you aren’t going to be able to hire all of them, but why let that be the end of it? Instead of hiring one candidate and ditching the other qualified candidates, I interview as many of them as I can and ask for their Skype handle so I can can easily contact them for future jobs. It’s a win-win. First thing you want to do is create your Skype lists. Skype lists will essentially be the job categories for different workers. Its the best way I’ve found to categorize employees and keep everything organized. Now that you have your Skype lists (categories) created you can start to interview and add your candidates to the list. After adding workers to the contact list, I will usually right click on the contact and rename them according to their expertise. For example, if they are a software developer that specializes in C# and MYSQL, I’ll rename them according to that skill so I know who to contact when needing a job that requires that skill. You can see at the time this screenshot was taken I had 10 potential programmers online that were just a click away from setting up a job. As your contact list grows bigger, you will always have a candidate online waiting to be employed, no matter what time of the day it is. 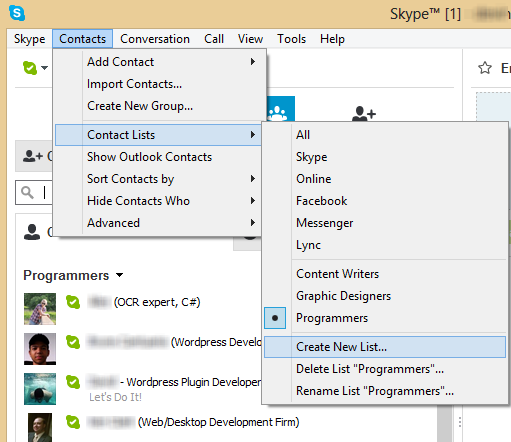 If you’re working online and thinking of outsourcing in the future, take the time to build out your Skype lists. It will save you tons of time and money in the future! Find me on: get all the latest tips, tricks and downloads from imdevin.com. Like this post? Let us know by leaving a comment below! below to get the latest updates, exclusive discounts, and software giveaways.